Picaro Obscuro immediately paints a bluesy landscape with the succulent, soulful opening notes of Ralph Carney’s saxophone before jumping into a gritty mix of guitar, harmonica and Latin-style percussion in the opening track, “A Curious Thing.” The mood is one that is at once both bleak and exciting—a snapshot of J Hacha De Zola’s hometown of Jersey City, also the subject of his earlier 2016 release, Escape from Fat Kat City. 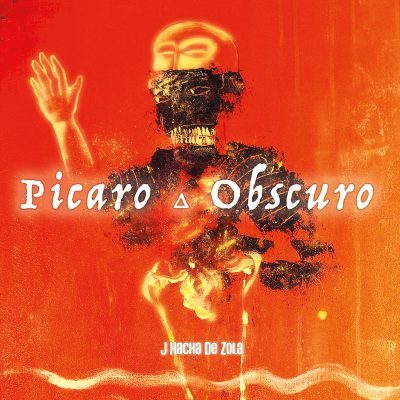 As far as the difference between the two albums go, Picaro Obscuro is certainly more of an abstraction; song structure seems irrelevant, and each play-through of the album offers a new perspective on the sounds that are thrown into the mix, tied together by De Zola’s crooning, guttural voice lingering over suspended notes. With the exception of “A Curious Thing” and “Falling Out of Chairs,” the lyrics are mostly unintelligable, but the agony that is conveyed through the depth and timbre of De Zola’s voice is enough to understand the dark undertone of his story. Standout single “Bubble Gum” starts with an interesting take on a blues standard, implementing a stark rhythm with a steely-sounding guitar and riding drums before De Zola’s voice slowly creeps in the background. The chorus is a series of groans in an almost white-noise fashion before a jarring transition back into the main rhythmic hook. Even despite the minimalistic lyricism, the music itself—in its stream-of-consciousness style—is somewhat introspective. The hints of saxophone and even flute in “Black Water” through a chaotically unstructured piece are distinctly personal in style. Sometimes, the introspection ventures into the realm of being cynically comical, as De Zola groans, “I wish you loved me,” over and over to the sweet, uplifting licks from Carney’s saxophone in “Dead End Street,” or creates an entire song around the words “Falling out of chairs for you.” And while songs like “Bubble Gum” are rhythmically appealing, other songs, such as “Tears of Summer,” take a little more patience to get through due to their lack of structure.